← Which DNS Service Should You Use? If you use Opera for your browser, you will be all too familiar with the Speed Dial feature. 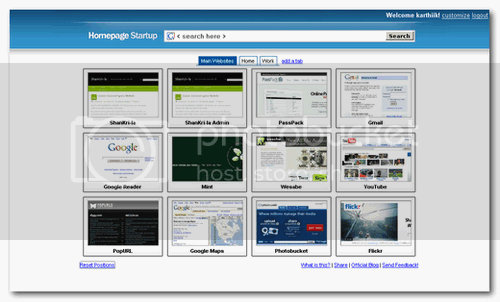 It is a feature where you can set a bunch of websites as thumbnails in your home page. Talk about power browsing with all your most used websites available in a single click as soon as you fire up your browser. If you use Firefox, there is a Speed Dial extension that lets you do exactly the same. This is all fine and dandy as long as you are on your computer. What if you are on the road using someone else’s computer and you can’t remember the darn website address? HomepageStartup is here to fill that niche. You can create a free account and set up all your favorite sites in there. You can customize the startup page to have upto 5 columns & 10 rows (50 thumbnails). Anything over 10-15 might beat the whole purpose of easy access, IMHO. In addition to quick visual access via website thumbnails, it features custom tabs. So you can group your sites by categories such as Home, Work, Bills, Blogs, etc. Tabs is something that is missing in the Speed Dial Firefox extension and I have started using this just for that. You can switch the default Google Search to MSN, Yahoo, Ask.com, Wikipedia, etc. You don’t need an account to use it on one computer but to save it and access it on another computer, you need to register for a free account. Customize number of columns, rows, background color, fixed/movable boxes, etc. I have a liking for web services that fills a special need. This one fills such a need and does it very well. Plus, this site is ad free and the author says in his blog that he intends to keep it that way. Hey this is great! I’m going to love using this. Thanks buddy! No doubt… this is awesome! Where do you find this stuff?